Within the piano part, there are two musical lines for the left hand and right hand, represented in the two staves. On the third beat of the bar, the right hand divides into two lines as well. We mentioned earlier that the duration element in a note moves the MusicXML musical counter, and that a chord element keeps this counter from moving further. In order to represent parallel musical parts, we need to be able to move the musical counter forwards and backwards independently of notes. This is what the forward and backup elements let us do. The first backup element moves the counter back to the beginning of the measure. The forward element that follows serves as an invisible half rest. The two note elements provide the quarter note chord. 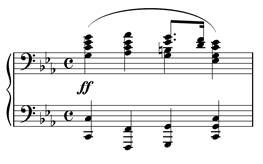 The last forward element serves as an invisible quarter note rest to move the music counter up to the end of the measure. Here, all that is needed is a backup command to go backup over the quarter note so that the dotted eighth and sixteenth are positioned properly. MusicXML can handle either type of multi-part writing. In Finale, most users find it easier to use layers rather than voice 1/voice 2, so our Finale-based examples will use that idiom more often. But the choice of what to use is up to you, based on what fits your software best. In both cases, we would then use a <backup> element with a duration of 16 to move from the end of the first staff to the beginning of the second staff, where we can continue with the left-hand line. MusicXML offers more features for multi-part and multi-staff writing that will be described in later sections, but the elements listed here are all that is needed to multi-part sound output.